Rainbow carrots have been popping up all over the place! I was trying to figure out what to do with the bunch in my fridge and soup was my first thought. However, I wanted to do something to highlight the beautiful colors of these veggies. 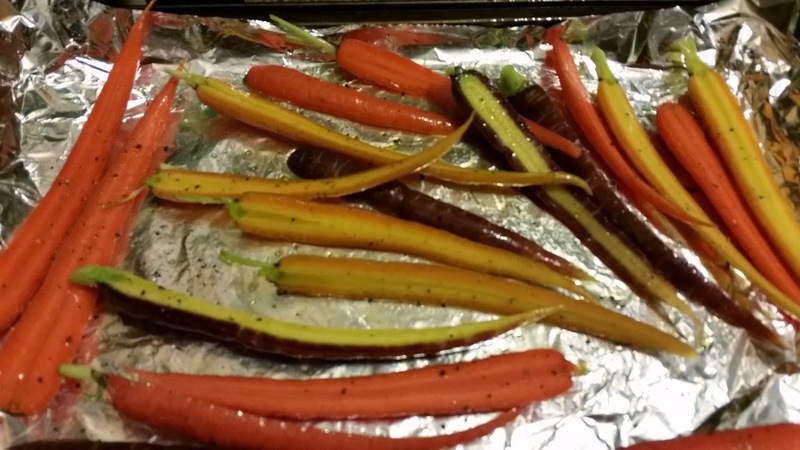 If you don't have rainbow carrots at your market, you can of course use regular carrots. 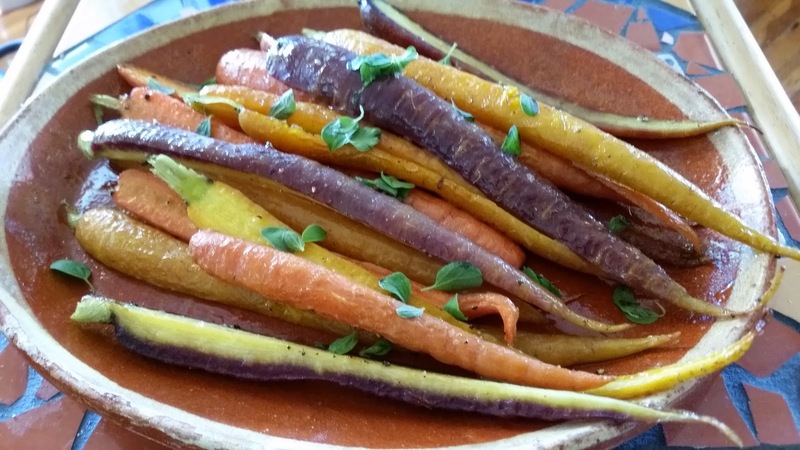 All you need is carrots, olive oil, salt and pepper. And maybe a fresh herb (parsley, mint, thyme or marjoram) to sprinkle over the top. If the tops are on, remove most of them and make pesto with the leaves, leaving a little stem at the top of each carrot. (If the carrots are a little older and the stems are turning brown or black, just cut off the tops. 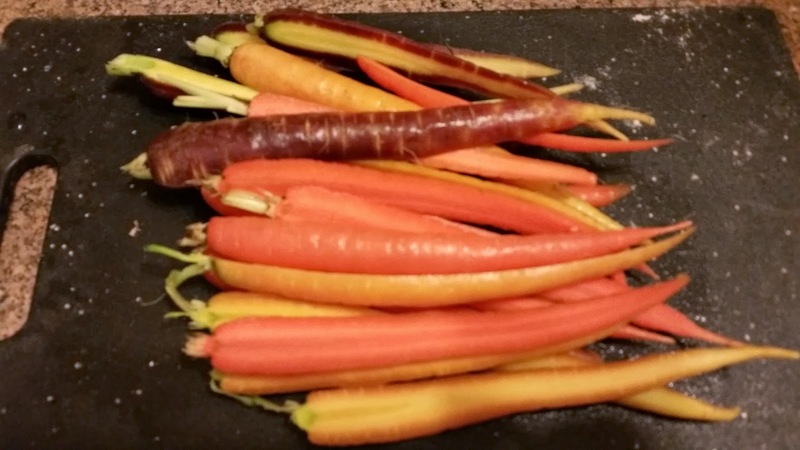 Slice the carrots lengthwise, cutting smaller carrots in half and bigger carrots in quarters. 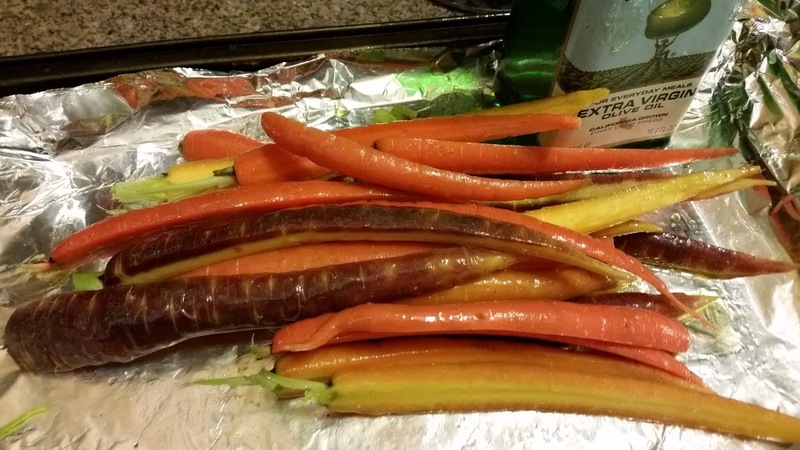 Pile the carrots on a baking sheet. I've lined mine with foil to make cleanup easier 'cause I'm already behind on the dishes. Drizzle olive oil (1-3 Tbsps depending on how many carrots, if you like to measure) over them and sprinkle them with salt and pepper. Roll the carrots around with your hands to coat them evenly. Spread out the carrots on the pan before putting them in the oven. Roast them for 15-25 minutes, depending on how thick they are and how soft you want them. The ends will start to curl up a little more when they're getting close. Test with a fork. Place them on a platter and sprinkle some fresh herbs or carrot leaves on top for flavor and color.